When the folks at DeNA asked me if I wanted to talk to the producer of a new G.I. Joe game coming to IOS and Android, I had one question: "Real American Hero G.I. Joe, or movie Joe?" Obviously they answered correctly. Extending the partnership with Hasbro that brought us Transformers Legends, DeNA's G.I. 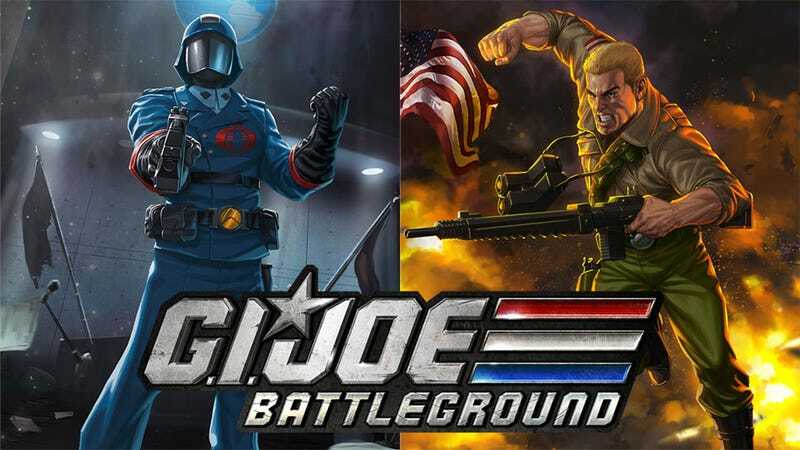 Joe Battleground is a card-based strategy role-playing game that aims to include every character from the series that's ever had an action figure. Yes, that includes the generic mail-away character, and characters from the more recent animated series. And while there's some tricky licensing involving real-life Joes like wrestler Sergeant Slaughter or William "The Refrigerator" Perry, producer David Phan plans on trying to get them included as well. That's how dedicated his team is to making this the ultimate mobile game for the G.I. Joe cartoon fan. "This is the first G.I. Joe mobile game that's been based on the cartoon," Phan told me during an interview earlier this week. The live-action movies have gotten a little love, but Battleground will be the first foray into the animated continuity. It'll also be the first time players will be able to play as either Cobra or G.I. Joe — some titles have dabbled with the idea, maybe made a few Cobra characters playable, but here players will be able to form a team from either side and take them into card-based strategy RPG battles. I've been down on the mobile collectible card game genre, and to be honest, I'm not expecting much more out of G.I. Joe Battleground from a gameplay standpoint. I was told it played a bit like Blood Brothers, another DeNA collectible strategy RPG. There'll be player-vs.-player combat, Cobra-vs.-Joe worldwide events, but it'll be more of a management game that an actual role-playing title. And I'm fine with that, because it's not so much about the gameplay as it is collecting cards with gorgeous G.I. Joe art (they've tapped IDW comic book artists for some pieces) on one side and classic character bios on the other. "The old classic file cards have been retained, with most of the original writing by Larry Hama," said Phan, eliciting a giddy squeal from my end. Some of those file cards were downright hilarious. Did you know the character Hit & Run got his nickname because his parents were killed by a drunk driver? It's like calling Batman "Alley Shooting." Phan knew. In fact, his level of G.I. Joe trivia knowledge was pretty damn impressive, which bodes quite well for the game. Battleground will launch with more than 100 characters from the various G.I. Joe cartoons, with regular updates planned until all 300-400 characters are represented. When all is said and done, it'll be an amazing way for fans of the franchise to collect their favorite characters without having to consult eBay and clear off shelf space. G.I. Joe Battleground is coming soon to iOS and Android. Fans can pre-register at the game's official website for an exclusive Storm Shadow card at launch.